Bring the water to the boil with the salt, add the quinoa, turn the heat down almost completely, cover and leave to stand for 10-15 mins. Spread the cooked quinoa on a baking tray lined with baking paper. Bake for approx. 20 mins. in the centre of an oven preheated to 180°C (convection), until golden brown. Remove from the oven, leave to cool. In a large bowl, combine the tahina with the maple syrup, lemon juice, soy sauce, chilli powder, salt and pepper. Tap the pomegranate all over with a spoon until it is a little softer, halve and place in your hand, tap firmly, holding it over the bowl, so that the seeds fall through your fingers into the bowl. Also add the mint, parsley and quinoa and mix everything together. Heat the coconut oil in a pan, toast the cumin, add the walnuts and maple syrup, reduce the heat and toast for approx. 5 mins. until the nuts are slightly caramelized. Remove from the heat, leave to cool. Mix 3/4 into the salad. 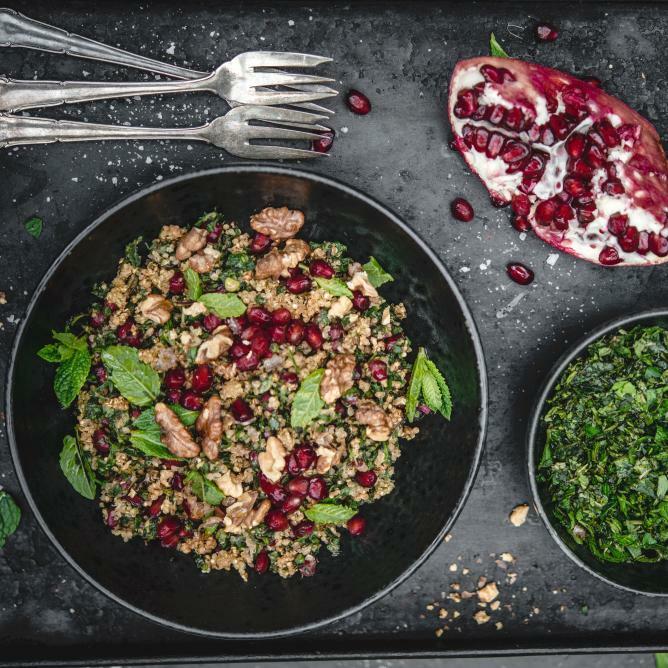 Serve the salad in bowls, scattered with the rest of the topping and garnished to taste with pomegranate seeds and mint. If you don't have the time to bake the quinoa until crispy, it can of course be mixed into the salad without being baked - it will just have a slightly different consistency with a hint of crunch, but will be just as delicious!